New "Pray for Us" graphic tee by the world-renowned Mala Suerte Compania design studio. New Mexican wrestler graphic tee by Mala Suerte Compania design studio. 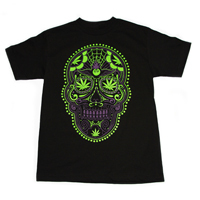 New "420 Day of the Dead" version silk screened with purple kush and chronic green and available is sizes medium, large, x-large, and 2XL. New 2015 Day of the Dead Collaboration by Explicit Ink Designs and Firme Clothing. 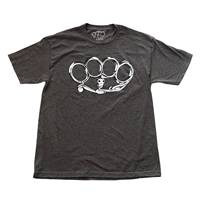 The official Mala Suerte Compania brass knuckles charcoal grey graphic tee. 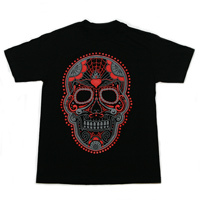 New mens "Tatu Baby" version number two graphic tee by One Shot One Kill clothing brand.